Provides visitors with a unique insight into what coal mining life was like in the Arigna Valley, since its beginning in the 1700's until closure in 1990. 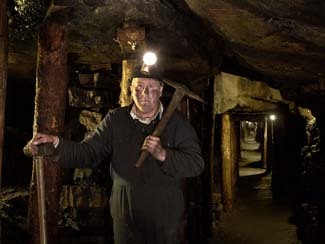 The Arigna Mining Experience Centre provides visitors with a unique insight into what coal mining life was like in the Arigna Valley, since its beginning in the 1700's until closure in 1990. During the underground tour, visitors will experience what it was like to work in some of the narrowest coal seams in the western world. The tour which lasts 45 minutes brings visitors to the mines coalface where the methods used to extract the coal are demonstrated. Lighting and sound effects throughout the mine, add to the reality to the experience.